An epic adventure fueled by imagination. Enter a beautiful world in a game about friendship, exploration and riding giraffes. Take on the role of a young adventurer as you travel the land and battle monsters-a-plenty in an epic quest to stop the evil Mr. B who is hellbent on turning your Papa into a delicious hot dog. But fear not, for you are not alone. You have the help of your best friends, Sparkles the Giraffe and your pet rock! Take down colossal monsters in the most epic, ridiculous and nail-biting boss fights ever to involve a giraffe and a hot dog-obsessed super villain. Adventuring by yourself is great, but let’s be fair...isn’t everything better with your best buddy by your side? Well, that’s why co-op gameplay is a big part of the Adventure Pals. Now you can bash up baddies alongside your BFF! 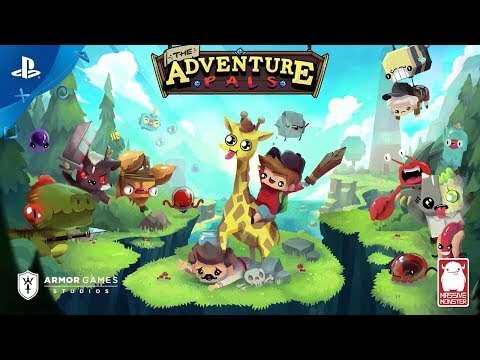 The Adventure Pals is a mixture of lovingly handcrafted platformer levels, combat-focused arenas and RPG-like locations with townsfolk who provide quests, items and other goodies for you to buy to aid you on your journey.